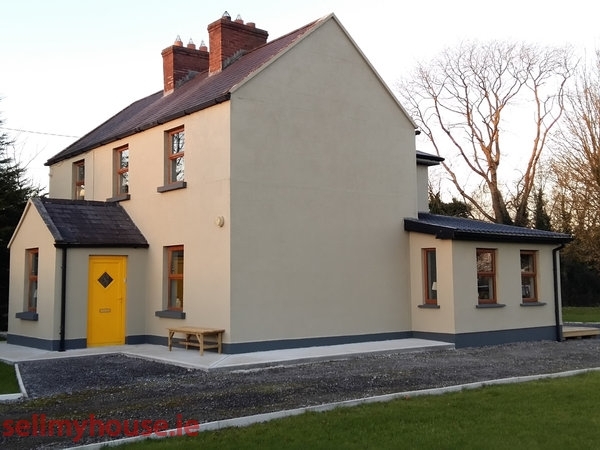 This spacious fully refurbished 4 bedroom house is for sale situated 5km from Ballinasloe on the Portumna Road.. Extra large double garage and attached play room/study/den. Bedrooms consist of 3 double and one single bedroom. Large family bathroom on ground floor plus additional bathroom with shower on first floor. 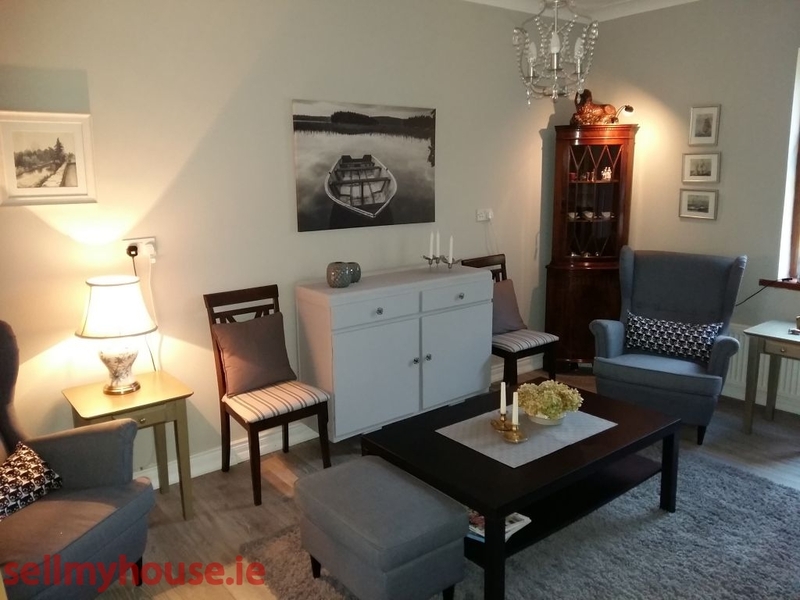 Attractive front entrance and drivway alongside going all the way to the back of the house where direct entry to the Kitchen Diner is situated. KITCHEN / DINER - Kitchen newly renovated and extended, table for six sits to one side. Light bright and with tasteful tiling and finishing. This includes tongue and grove panelling around Dining area giving a nice warm country kitchen feel. Door leading to utility room and further door to bathroom. Walk through opening from kitchen to the 1st of 2 living rooms. LIVING ROOM 1 - This room is tastefully decorated and has a cast iron stove with white fire surround. Large window to front of property. Hallway leading from kitchen has stairs on left and 2nd living room to right. There is storage under the staircase. This hallway together with all the way up the stairs and wrapping around the landing upstairs see again extensive use of T&G to enhance the country feel. LIVING ROOM 2 - mirrors the 1st in size and ambience. 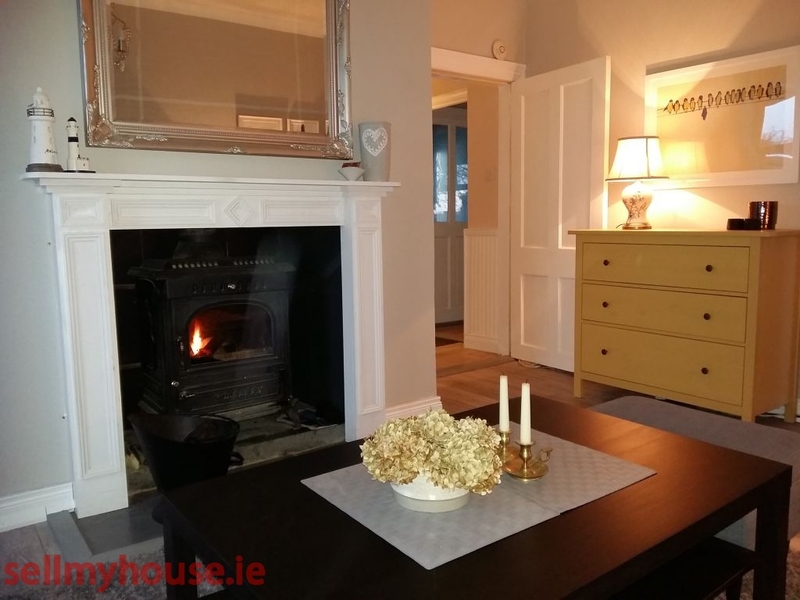 A welcoming open hearth fire with surround makes this room cosy at all times. Built in cupboards allow for plenty of storage and provides ample space for the tv/associated electronics. Windows to front and rear in this room. On exiting the 2nd living room one has the main entrace front porch to the right and the stairs to upper floor on left. At the top of the stairs to the right is one of 3 double bedrooms and the smaller bathroom, newly renovated with corner shower, new vanity and toilet. 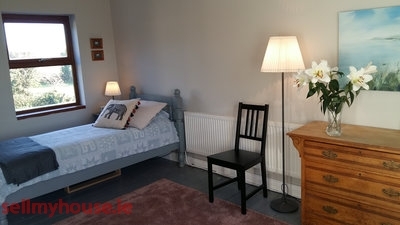 To the left are the three remaining bedrooms, one single and two double, the largest of which has windows both to front and rear of property, along with extensive built in wardrobes, floor to ceiling. The other double and single bedrooms have windows to front and back respectively. On following the drive round to the back of the house the large Double garage and Hobby room come into view. There is sufficient space to turn around vehicles at the rear of the property and thus plenty of off street parking. Garage and Hobby room/Den - The garage is a larger than normal double and has plenty of room for two vehicles. There is also ample room for logs/turf and a workshop with cabinets is in place at rear. There is power and light to the garage with own fuse box, breaker. The garage has two pairs of steel doors adding further to the quality of the building. The Hobby room/Den is very large, extending to 26 sq metres. Both Garage and connected Hobby room are recently built and have slate roof and rendering to outside. The Hobby room itself could easily be converted to additional living accommodation or Granny flat, and indeed if the Garage was to be upgraded too, one would have a very fine cottage spanning over 700 sq feet. Any changes as outlined above would of course be subject to FPP. The grounds give uninterrupted views of the local countryside and we often have herds of cows or sheep peering into the garden from the adjacent fields. A large expanse of grass sits to the right on entry to the property, whilst a lesser expanse wraps itself around the house to the left and meets up with the garage and deck which is directly outside the kitchen. All external walls dry lined with polystyrene sheeting behind.